Are you looking for a way to analyze the impact of your content? Do you need a simple system that works? If you don’t have the budget for expensive software, spreadsheets and a little of your time can produce some useful data. In this article I’ll show you how to analyze the engagement and impact of your social media posts using Excel. Time to fill in your spreadsheet! There are a number of ways to do this, depending on the networks you use. Below is an example of a spreadsheet for a retail company using the above-defined categories, subcategories, targets and meta-tags. Populate your spreadsheet with post details. There’s a lot of information to gather, but it’s all easy to find. Twitter Analytics has an Export feature for your last 500 tweets, and Facebook Insights can be exported in 180-day chunks. Export regularly to make sure your data is current. Use a tool like bit.ly to keep track of your link clicks. If you tend to post the same link multiple times, make sure you’re attributing your click to the right content by using tools like HootSuite‘s Click Report or BufferApp to track which specific posts generate the clicks. Each of these tools has free versions that allow you tomeasure posts on multiple networks. To identify your best-performing content across all of your networks, sort the Total Engagement column in descending order. The best-performing posts in terms of engagement show at the top of the column. After sorting by Total Engagement, your most successful posts show at the top of the spreadsheet. To find the best-performing posts for specific social networks like Twitter or Instagram, filter first by Network, then by Total Engagement. 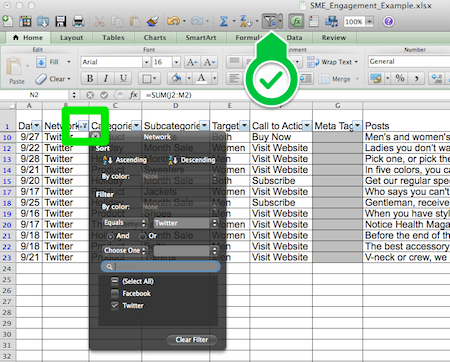 Filter your spreadsheet to find the posts with the highest engagement on each network. The next step is to manually filter for the categories and subcategories you’re interested in reviewing. This spreadsheet is filtered to show only Product category posts. Excel is very literal, so if you include more than one category or subcategory assigned to content, you’ll need to use the “contains” input in the Excel Filter feature, rather than selecting the check boxes. Use this setting to see the rows in the column that have multiple subcategories assigned, and those with just one. Use the “contains” filter to show Product category posts that cross into multiple subcategories. Once you identify the top posts in your categories, it’s time to analyze them for post copy, sentence structure and images (if applicable). What trends can help youoptimize content for each network? Here are examples of three posts that promoted the same link. A comparison of three posts promoting the same link shows that engagement was highest with men. In this case, analysis shows that the shorter post lengths received more engagement. Among these similar posts about sweaters, the post using two different images generated a higher click-through rate with males than with females. You don’t have to rely on intuition to find out which posts perform best for you. Use Excel to reveal important insights about post engagement in nearly real time andmake more informed decisions about your content strategy. What do you think? How are you currently measuring the impact of your content? Do you have other strategies or tools that you use? Please leave your questions and comments in the box below.